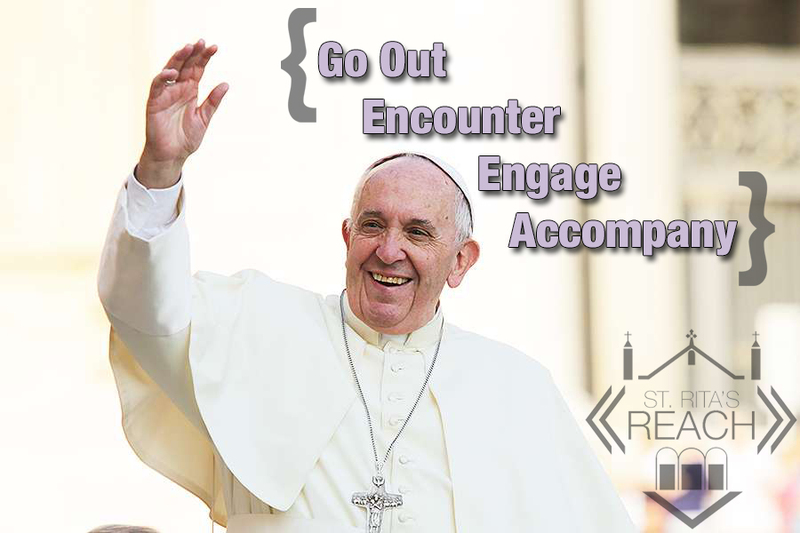 Inspired by our call to be a missionary Church and Pope Francis's reminder to engage the world, St. Rita's Reach seeks to better encounter those within our parish territory through the ministry of regional teams. Consider becoming part of the exciting ministry of engagement. Simply look for your region on the map and fill out the online form. If you are a parishioner living outside our geographic territory, consider signing up for a region closest to you or one that most interests you. Introductory Meeting: Sunday, September 8th after the 4:00pm Mass in the Moreau Center. If the parish proves capable of self-renewal and constant adaptivity, it continues to be “the Church living in the midst of the homes of her sons and daughters.” This presumes that it really is in contact with the homes and the lives of its people, and does not become a useless structure out of touch with people or a self-absorbed group made up of a chosen few. The parish is the presence of the Church in a given territory, an environment for hearing God’s word, for growth in the Christian life, for dialogue, proclamation, charitable outreach, worship and celebration. -Pope Francis, Evangelii gaudium, 28.